Pragmatic Marketing runs an annual survey of product managers. 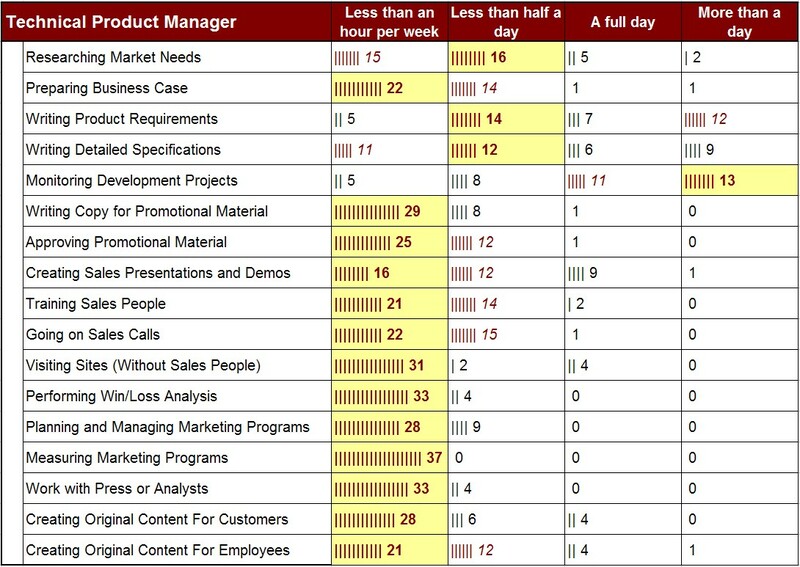 We looked at 440 results from the 2006 Product Manager Survey to uncover the trends in how different product manager roles are defined. The survey involved questions breaking down the allocation of time to different activities. In this article we look at how those activities varied for product managers, product marketing managers, segment / market managers, and technical product managers. For most people, the first thing they want to do is understand product manager compensation data. That article included an analysis of gender bias in product manager compensation. We quickly followed with another article that provided details on product manager compensation versus company size. 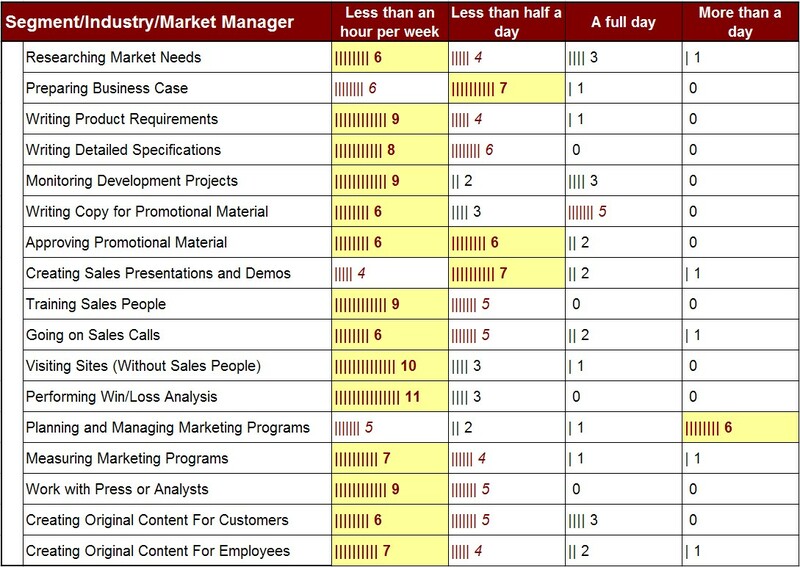 In response to reader questions, we took a look at product manager staffing levels. In that article, we tried to determine how many product managers to have for X products. Now that we know how many product managers to hire, what should we have them do? The role of a product manager is strategic. There are six areas of activity that are critical to product management. Within those six areas are a number of activities, and respondents to Pragmatic Marketing’s survey provided a lot of data about what they do on a weekly basis. The survey asked product managers how much time they spent on each of seventeen different activities. Here’s the breakdown of time spent by activity for all survey respondents. 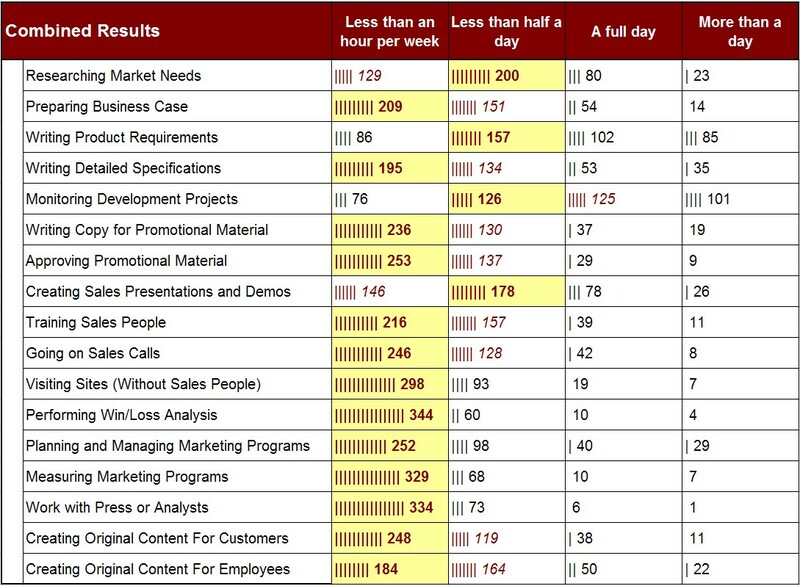 The numbers in each cell are the number of respondents that selected that level of effort for each activity. When a cell represents more than 25% of the respondents, the text is colored red and marked in italics. For each activity, the level of effort that had the greatest number of respondents is also bold with a gold background. Very consistent with the elevator pitch (30 seconds or less) description of what a product manager does. And all but the last one (sales-support) are identified as strategic activities. More than half of the respondents spent a day or more monitoring development activities, though. That seems a little high. Perhaps a more detailed analysis of the data will shed some light.The survey data asked people to describe their titles too. Next we evaluated the levels of effort by title. Here are the same tables, but filtered to include only the responses by title. 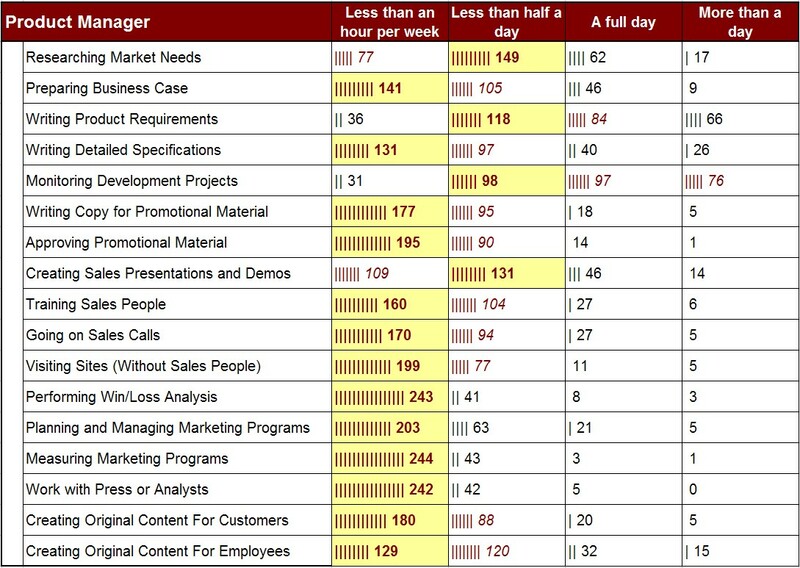 The data for respondents with the title Product Manager is very consistent with the overall group data. Product marketing managers have a very clear focus on sales and marketing support. They spend as little time as possible monitoring development activities. They also don’t appear to be sacrificing a subset of the marketing activities – their effort appears to be relatively evenly distributed. There were very few product-line manager responses in the data, but the areas of distinction are that they spend more time on preparing business cases and approving promotional material. They also spent far more time planning and managing marketing programs. This is good – these are the activities best leveraged across products. Technical product managers spend much more time on inbound activities like monitoring the development team. They also are more heavily involved in writing detailed specifications. They still have healthy levels of market research and writing requirements. And they minimize the time they spend on outbound activities like sales and marketing support. The levels of effort are generally reasonably well distributed across the many activities identified in the survey. Further, the roles that have distinct focus (inbound, outbound, multi-product) spend their time appropriately.